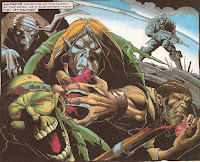 -including the ‘Funeral for a Friend’ poster strip bagged with a Megazine one time. but not including the IDW Judge Dredd: Year 1 series (although it’s worth noting that’s the best thing yet to come from the IDW Dredd-iverse). Characters of glorious ugliness. Sideways slanty mouths. Action that draw the reader across the page. There’s surely a better word for it, but his current style brings to mind the word ‘gnarly’. Moodier, darker, more morally ambiguous. Simon Coleby has proved the longest-serving of a great wave of Simons* who joined 2000AD in the late 80s / early 90s. He’s also undergone perhaps the most radical re-invention of the all. Basically, there’s early Simon Coleby, who is chunky and garish and angular and action packed (and a ton of fun). And mostly in full colour. A very simple face design that conveys all you need to know about this dude right here. Then there’s contemporary Simon Coleby, who’s equally action-packed, but also super-detailed, scary, moody, and kind of amazing. And mostly in black and white. The new style - requires 150% more ink. This time, character is conveyed in clothing and body language as well as the faces. It’s not fair to speak ill of an artist in their early days, but I will say that I found something about Coleby’s early stuff, along the lines that it felt like I might just be able to draw like him. Not to say that he wasn’t a good draughtsman, but I found his style unintimidating; his storytelling very straightforward. 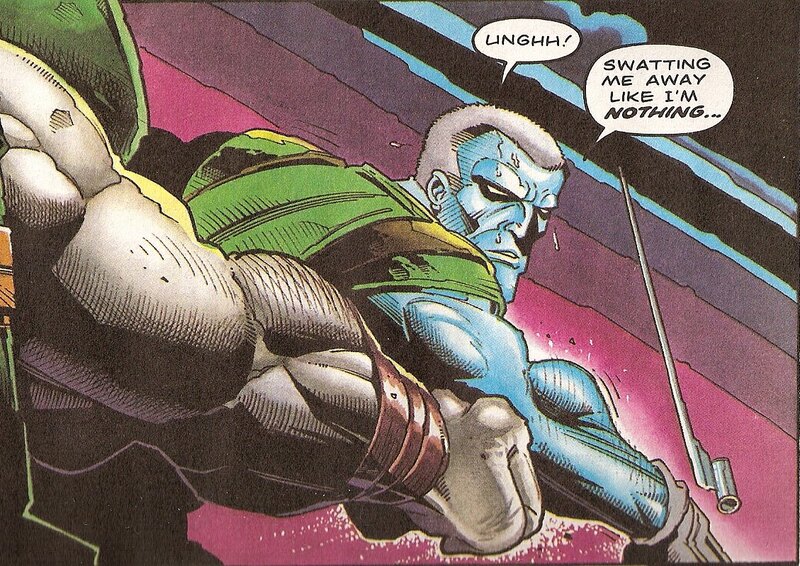 This is probably most apparent in his very first story, Universal Soldier II. Where the first book by Will Simpson was rain-soaked, a bit grimy and sometimes tough to follow, Coleby’s Book II was refreshingly easy. In all honesty, I hadn’t a clue about the back story when I first read it, but taken on its own as a sort of post-Robin Hood pre-Braveheart war story, it was jolly fun. Check out how everything slopes a little bit down and to the right. Basic dynamism, or a wonky desk? 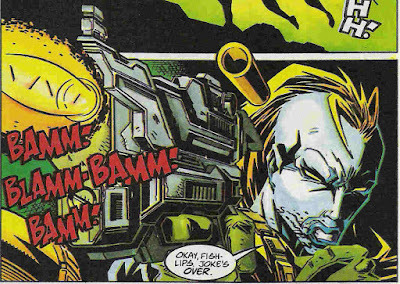 Coleby started pushing the boat out when he moved to Dredd and FrIday-era Rogue Trooper. He started pulling faces this way and that, unafraid to embrace the old cartoonist standby of exaggeration. If it sometimes erred too far into silly, so be it. I mean, what else do you do when the story calls for a character with a detachable jaw big enough to swallow a fat man whole? That is a bold head:helmet ratio right there. Actually, what really stuck out to me as a young reader were Coleby’s faces. Particularly the mouths. Even more particularly, the constant downward slope. Even the punches go down and to the right. You could also argue a case for Coleby following contemporary fashions for mega-muscled body-builder types, along with endless spraying bullets. Coupled with grimaces. 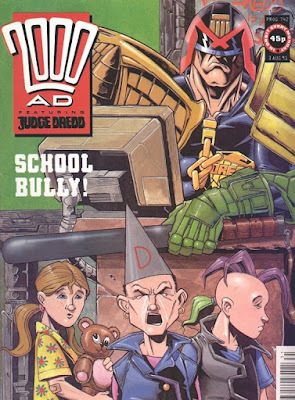 Certainly Dredd at the time was falling into this pattern. Coleby I think fit the bill well, not least with his facility for drawing moronic cits (and arguably a few not-too-smart bureaucrats, too). So many bullet cartridges! More sloping foreheads! This style served Coleby well enough for a few years, reaching its apex with a short stint on Venus Bluegenes. The gnarliness is creeping in. Also, giant lips. Who you callin' fish lips, lady? 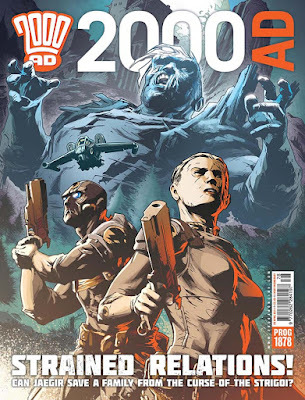 Rogue Trooper: cool, original flavour. And then nothing for around six years (perhaps a victim of the Bishop cull?) – before he exploded back into view working with Gordon Rennie (a choice made by both? Or perhaps a canny editor who saw a neat fit). 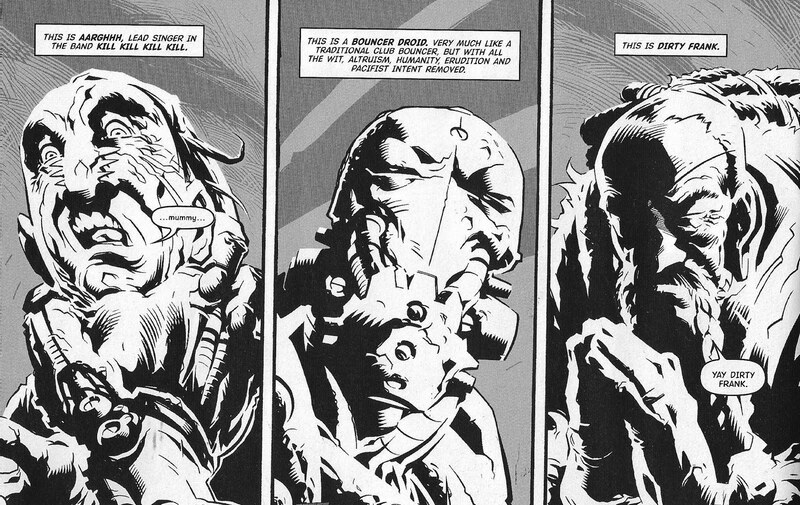 His work on the back to basics Rogue Trooper series was a revelation of monochrome glory. Deliriously craggy villains, a Rogue that managed to be both muscley and lithe at the some time – that’s a clever trick right there. You want an angry bad guy face? I'll give you an angry bad guy face!! And then just casually introducing Rafaella Blue, a character who would go on to have her own series. Chunky guns, thick-soled boots, massive zip - yup, this girl's ready for a career in 2000AD. Over in the Meg, and still with Rennie for much of it, Coleby made a return to the world of Dredd. Sticking with the new style, it’s perfectly made to capture old, grizzled Dredd. Something about the way Coleby adds in shadows and wrinkles everywhere. It’s not that his Dredd is super-aged looking (as some artists have it), more that everything about him, from chin to boots, is gnarled. Grizzled, chiselled and gnarled all in one. Just a deliriously fun angle to highlight a comedy chase. Most memorably was Bato Loco, a comedy foil who also went on to have his own very occasional solo outings. Now, there are of course some eyebrows to be raised at the very idea of ethnic stereotyping in this kind of character (I think he’s theoretically Puerto Rican, but at this point in MC1 history, you’ve got to wonder if there’s a steady supply of new immigrants or if it’s just a community that makes a point of latching onto old accents). BUT Rennie I think knew what he was doing. He’s working in a Wagner/Grant tradition of equal opportunities laughing at everyone, and in fact bringing some diversity of character in. Above all, Bato Loco as a story is a comedy effort, with the hero’s own attitude (and idiocy) being the point, coupled with absurdly convoluted plot machinations not some suggestion that this is in fact endemic to all Puerto Rican New Yorkers or what have you. I hope. Coleby, of course, was along for the ride of drawing pictures to sell the character and his womanizing ways, which he does very adeptly. On to Malone, in which a man with a past attempts to rescue a troubled waif but is haunted by visions of an especially terrifying clown. We all know what it means now, sure, but at the time it was pretty odd. It read like a standard noir story, but the clown, and indeed a heightened atmosphere added by Coleby, gave it something of the horror. It all clicked together especially well. Tharg's second go-around at the 'scary clown' subgenre. More please! Coleby next clicked well with Rob Williams on Low Life. I’m not sure if it was either man’s intention or desire, but as a pair they moved the strip from a serious action story that investigated doubt into a comedy action story that investigated the depths of weirdness of MC-1, with unusual characters being the order of the day – characters that dominate the plot, to be frank (pun intended, I guess). Good comics is all about the characters, yes? Babies that actually look like babies! Not often as well-handled as Coleby manages here. and then full-on mood-enhancing cover on Jaegir, Coleby’s fourth outing into the world of Rogue Trooper (which I guess makes him the artistic curator of that Universe at this point). Jaegir is inhabited by monsters of all stripes, both physically and emotionally. That gnarliness is front and centre. Coleby does an especially standout job on showing the characters’ inner turmoil. The eyes, the wrinkles, the posture - it all speaks to a haunted past. Comedy and Tragedy, Action and Emotion - he makes it look easy! Friday: I retain a soft spot for the Saharan Ice Belt war. 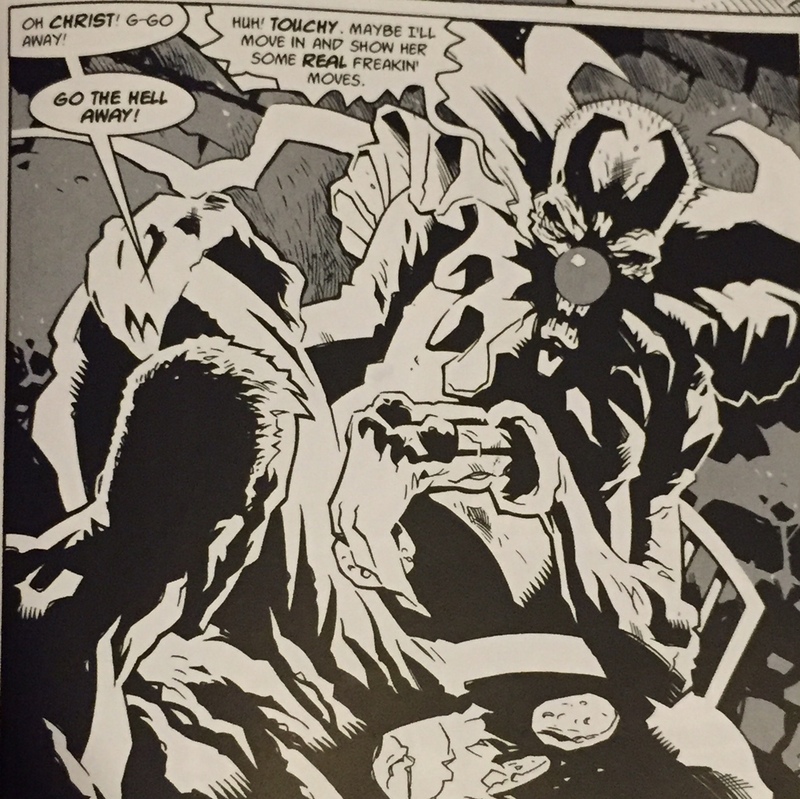 Malone: probably my all-time fave of Coleby’s work. Jaegir: I’m not 100% on board with this series, but the art is stellar. Brilliant piece, Alex. SMS is a Sebastian - Sebastian Melmouth, no less.